Remain a cultural producer. Make stuff. Do stuff. Keep thinking. 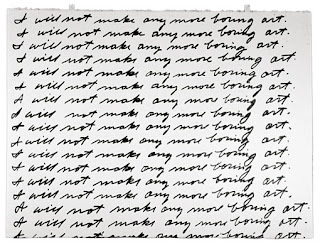 John Baldessari, "I will not make any more boring Art", 1971. Can be found in the entrance foyer of the Nova Scotia College of Art and Design. The performance and subsequent lithographic print was made by students working from directions sent to the college by Baldessari. Not that I don’t do this already, and it’s absolutely possible that people reading this blog do this too, but for anyone who starts to wane, convincing themselves that conceptual and theoretical exploration doesn’t play out in the real world, in the work-place, in your ideal job, then you should straighten up and re-realise that it’s as important as developing those basic database skills, those promotional skills, those budgeting skills. Both the ‘practical’ and ‘theoretical’ operate in tandem with one another (they’re close enough to be making out when no one’s looking), if only because they exist as a perpetual dichotomy; throughout my time in art school, to my time in-between schools in the working world, to my time in my masters degree, and especially now, as a recent graduate, tempted to throw out all conceptual endeavours in order to learn HTML and earn certificates in fundraising. What do you want to do? There’s a place for you, but as I’ve been recently advised: “You’ll have to pay your due in the mean time.” Exhaust yourself within the scene, go to events, talk to people – not necessarily about needing work, but about what work you already do as a method through which to collaborate with people, with ideas, with projects – it’s all there to be mined, but you certainly have to do some digging and make sure that people can see the dirt on your knees and the pick axe in your back pocket. I see curation and writing as processes that make ideas live in the world through thoughtful development and an interest to provoke. Learning HTML and how to hang a painting can help you get into a comfortable position through which to pursue these processes. With aspirations to be a curator, I see administrative skills as a practical asset: the skills I chose to learn and develop are an act of curation (why not? ); they are the result of clever considerations over the composition of elements with the goal of creating a larger message, or indication of a message. There was a recent article in the New York Times by Alex Williams (2 October 2009) about the co-option of the term ‘curating’ by bicycle assemblage shops and clothing boutiques. I don’t disagree with this new development, as the term never had a definitive life in the art world to begin with – I still don’t know what curating is as a single practice, so why can’t other people make sense of it while the art world fumbles? Figuring out how curation operates as a skill and a practice in my life is a way of determining my own distinct path towards it – that includes working through different paths, such as visual arts practice, administration, fine-art framing, database management with a spattering of barista service. It will all add up, as long as the deep thinking doesn't get thrown by the wayside.